With 3 mm of solid aluminum casing surrounding the disk inside, the LaCie Mobile Drive keeps your data solidly protected. 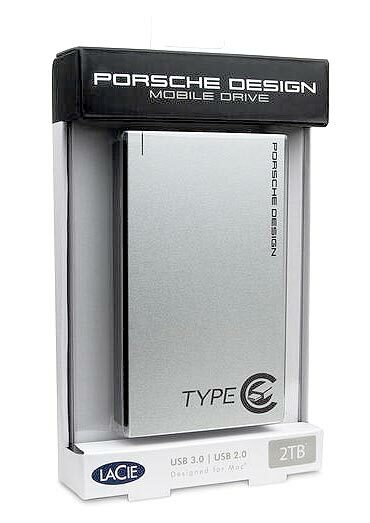 The LaCie Porsche Design p’9223 1 TB Portable External Hard Drive is a result of collaboration between world famous design firms and LaCie. The drive is a combination of speed, design, and technology to make it a superior drive. It includes online Wuala cloud storage account with 10GB for a year and software that includes LaCie’s Public-Private as well as Backup Assistant. It works well with Windows XP, Windows Vista, Windows 7, Mac OS. The drive is silver in color, weighs 12 ounces, and is available on Amazon. With 3 mm of strong aluminum casing surrounding the drive inside, you can be sure that your data is solidly protected. LaCie and Porsche Design worked together to combine form and function, resulting in a mobile drive that looks great (and works great), no matter where you take it. To note, while Mac OS X doesn’t natively support USB 3.0, you can add USB 3.0 to your Mac computer by installing LaCie’s USB 3.0 Mac driver and a LaCie USB 3.0 computer card. The USB 3.0 interface is also backwards compatible with USB 2.0, so you can connect it to any computers that use this older interface. LaCie Porsche is a 4.5 star rated product that features easy, quick, and worry-free backups for all sorts of operating systems. It is compatible with USB interface 3.0 which allows you to transfer files faster than ever before – a 700 MB video file in just under 7 seconds. Some of the customers have reported about the loose USB that falls down and sometimes you have to hold it during the data transfer. Another significant issue is the absence of warranty and customer support. Was designed especially for Mac computers, and features a stylish, sophisticated aluminum finish that matches your new MacBook®.